Don't Forget the 1st Presidential Debate! We'll be watching the debate tonight - after all - both candidates have given us interviews so how could we miss it????? If you haven't read them yet, the links to the interviews are in the right column. Are You Headed to . . . .
A letterboxer by the trail name of Toucan has just placed a letterbox on the island of Tobago! Letterboxing has truly become an international pursuit. Click the map above for the clues - love the last line!!! Seems like our new best friend, Alafair, has seen fit to find the Rosie Ruiz HH and is moving her soon close to her goal of NYC and the finish line! We've lost sight of the other participants in this race while we were away, but are pleased to see Rosie getting near the end of her cross country trek. Thanks to all who have moved her along towards the finish line! First Day's Installment of our Trip is Ready! Read our Dartmoor adventures of Friday and Saturday. Not going as quickly as I had thought. Check back on Monday for more pictures to be inserted into the story. It's great to be back. The trip was wonderful. We met our goal of visiting Cranmere Pool on it's 150th Anniversary and we managed to find almost 200 Dartmoor letterboxes - 185 to be exact - in the 3 full days we spent on the moors! The group got along wonderfully and there were nights we all went to bed with sore sides from laughing. Stay tuned on Sunday evening when I'll have our first installment of the Baker's Dozen and our adventures. See You at the Monster Mash! Don't forget to make the Monster Mash gathering on Saturday, October 2 in Mansfield, CT from 11am to 6pm. This will be a huge gathering with well over 100 letterboxes out for the month. Join the festivities with Monster Trivia, Raffles, Exchanges, etc. Click the graphic above to transported to Chuck Straub's wonderful site that has all of the details. Sue & I are doing some shopping in England so that we can add a few Dartmoor National Park items to the raffle. Baker's Dozen Headed for the Moors! After 12 months of planning, our much-awaited trip is finally here! We leave on British Air on Friday at 8pm and arrive in Heathrow at 8am Saturday and will hit the ground running. After procurring our 2 minivans and car, we begin our 3.5 hour ride to Dartmoor National Park and the Langstone Manor Holiday Park, where we break up into groups in 2 cottages and an apartment. Letterboxing will include the 150 year old Cranmere Pool letterbox, where it all began! There will be a group of letterboxers meeting us Sunday morning on our first full day out and a group later in a pub for a mini-gathering. Monday morning brings our new friends, Louise and Chris Donovan as they join us for 2 full days of letterboxing. Tuesday night is a special surprise for the group that we will divulge when we return. After 4 nights and days on the moors, we head to London via Stonehenge and the Avebury antiquities route on Wednesday morning. Our trip ends with 3 nights in London as we tour the city, attend a play, and even do a few of those urban boxes I've been talking about all year. We depart Heathrow Saturday evening and return home at JFK on Saturday evening. During this time, there will be no more posting to this website unless there are some real important events to report! Stay tuned for a complete diary of our trip, with commentary, pictures and a little gossip, when we return. Just have fun and get out there & box!!! Click my shell for a "ride" to an great boxing website. Enjoy and be sure to register!!! Like this hourglass, our time to pack and get ready for our Dartmoor trip is dripping away - one grain at a time. And with each diminishing grain, our excitement level increases a notch or two! Well, I'm out of the doghouse. As I was coming up the stairs to our bedroom, I noticed a small blue pouch under the foot of our bed! Guess what was in it? 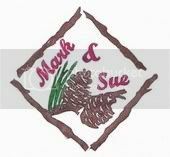 Our signature pinecone stamp. Thankfully, I don't have to worry about carving another one before we leave! At last count, we are taking over 15 HH's [really more like Traveling Event Boxes] and boxes to permanently leave in Dartmoor. While British Air allows each passenger 2 bags each to check, I asked that we keep it down to 1 bag each - as 13 travelers at 2 bags each would amount to 26 bags! So - Sue & I are the first to break that rule - as the HH's and clues for Dartmoor take almost a whole suitcase! Sue and I thank all of you who have taken the time to carve and send a HH/Traveling Event Box or permanent letterbox our way for The Baker's Dozen and their hop across the pond. Sarbear Gives Rosie a Plane Ride! SpringChick reports that Rosie Ruiz spent the weekend with her and some other letterboxers in MI and WI and was picked up at Ring Around the Rosie Letterbox by Sarbear. Sarbear then hopped a plane [didn't realize they let wild animals in coach] and is going to drop Rosie somewhere in the East. Could Rosie have the finish line in her sights? I hope I get a chance to report that before we leave for Dartmoor. Stay tuned! Rosie HH is in a New Place! Wes Garrison has finally come clean! He left the infamous Rosie Ruiz HH in Michigan on his way to Toronto several weeks ago. While departing from normal HH protocol, Wes has posted on the big list Rosie's new and very appropriate location: SpringChick's Ring Around the Rosie letterbox. First solve this mystery letterbox, then move Rosie along to her NYC finish line! Seems like a certain letterboxer has lost their signature stamp while packing for a Dartmoor trip! Sue is about to kill me. She tends to be very sentimental and although of the store-bought variety, this stamp means a lot to her. I just hope it's in our suitcase when we cross the pond. No time to carve a new pinecone for now. I plan to use an extra stamp mailed to me by Chris from ScoutDogs as our British trip traveler for exchanges with UK boxers. Hopefully, I'll be out of the doghouse by the time Friday arrives! Our Box of the Week is an older box, that has all of the right elements: a great hike, nice location, wonderful views and hand-carved gems - Sadie & Russ' A Drive in the Park. Located in West Rock Park, this series of 8 boxes is a great place to see some foliage or take that longer hike now that the weather temps have moderated. Russ is one of CT's best carvers and he makes a hell of a great clam chowder too! Our Poll of the Week was a suggestion sent to us via email, after we offered to showcase some of your ideas for the weekly poll. This one deals with the question of whether boxes should have a "shelf life." Might a term on a letterbox allow that placer the freedom to place other, newer, more creative boxes within a given area. Would that change the complexion of boxes in areas where letterboxes are not as abundant as they are here in CT? Place your vote now and please email us with your idea for a poll. Website of the Week honors go to the Letterboxers Anonymous website. Check out the link in the right column. Land & Sea - Quite a Place to Be!!! A small group of about 10 of us were invited to a special day prepared by Butterfly and Sadie & Russ. They called this little event Land & Sea. We were told to bring our canoes or kayaks, supplies and a dish to share at Butterfly's cottage. Little did we know what lay in store for us! We first searched for buried treasure map pieces on the beaches of several small islands via our canoes in the Giants Neck area of Niantic. Then, on land, after assembling the map pieces, we searched for the boxes. Those were all brought back to Butterfly's where we stamped and ate and stamped some more. A great day out in the canoes with wonderful friends. Sue and I thank Butterfly and Sadie & Russ for a fantastic day that not only let us take our canoe out [for the first time this season], but enjoy a day of boxing among friends. We appreciate all of their hard work! Their intent was to spend a day together while bringing some happiness to a day filled with such horrible memories from the tragedy in NY three years ago. There was time spend discussing our memories of that event and some time at the Memorial Garden in Giants Neck with a special commemorative stamp. A day spent remembering, recreating and rejuvenating. Think I know where to find this one! Looks like Dee must have been busy packing for Dartmoor and got a little lazy with her letterboxing clues! She thanks Butterfly for the inspiration. Judy from VA, one of our most vocal Dartmoor travelers, has seen fit to put up a new poll on the big talk list. This poll asks for your vote on the recurring theme of making the letterboxing.org website accessible only by some sort of membership and password. While some feel this is exclusionary, others feel that this is an attempt to ensure the integrity and safety of our boxes as they come under the scrutiny of inquiring eyes due to the recent spate of publicity. Vote now to have your voice heard! In a related bit of publicity news, I have been asked to consult or write a book on letterboxing. The publishing company is very well known and has already published a book on geocaching. The request was spawned after an acquisitions editor took a lengthy tour of this website. While my initial reaction was filled with fame and the talk show circuit [! ], once I came down to earth I decided to nix the idea. Letterboxing does not need another book or more publicity. This "how to" format would leave nothing to the new letterboxer to learn on their own - it would all be handed to them! In my humble opinion, the best part of letterboxing is the discovery of all of the different facets of this hobby. Four very special people helped me reach this decision: Sue and 3 other well-known letterboxers. They reaffirmed my gut feeling and I am truly thankful to them all for I value their opinions and friendship! I guess that about sums it up! The letterboxing world seems to be on hiatus - the planting of boxes appears to have slowed, the talk lists are civil and peace remains in the letterboxing kingdom. Can it stay that way for long? Not if we can help it! I received an email from friends down south, wondering if we were getting burned out after keeping up this website or just scurrying around getting ready for England. The lack of new posts on this site prompted that email, along with their concern that we might eventually curtail this website. No - we are not burned out. We have not had much to write about with the slowdown of letterboxing news, coupled with the fact that our home has been a beehive of activity - packing, planning, etc for the upcoming Dartmoor trip. Another time-consuming, yet very rewarding task has been that of getting The Four Directions site designed and ready for the possible debut in October. It's been a pleasure working with Koyote, who has been a pure joy with which to work over these past months. Rush Gatherer and PowWow Dancer have also been a great help. Our hope is that this wonderful series that celebrates the Native Americans gets the notice and credit that it deserves. I cannot even begin to tell you of the hours they have put into this series; not counting the contributions of the individual carvers from around the country, who have offered letterboxes for the individual tribes. Sue and I are starting to get excited about our England trip. Our group, The LBNA Baker's Dozen, leaves for Dartmoor on September 17 - only 11 days left! We are bringing some great HH's from some of the best carvers in the country. We want to show the Brits how we Yanks can carve up the old stamping rubber! Thanks to all who have participated. A few of these HH will remain on the Moors, the balance will be returned to their creators and you may be able to search for them in October in a box near you! Please be advised that during our trip - September 17 through September 25, there will be no postings to this website. But stop back shortly after that as we plan on a very extensive commentary with photos related to our trip. Box of the Week is Waterfall's Waterfalls Twelve. Located in Norfolk at Campbell Falls, the inspiration for this box is that it is the favorite waterfall of one of Waterfall's friends. Website of the Week honors goes to Der Mad Stamper and his Der Carved Stamps. Poll of the Week relates to your favorite interview from our Interview Series of letterboxers. We have 5 already in the can and are working on 2 more. Hope your Labor Day weekend is a good one. Sue and I are headed to VT through Sunday night. Monday, while Sue works, I will be letterboxing in CT with friends. Hope your weekend is safe and box-filled. Stop back on Monday for our Labor Day goodies and box report. The Four Directions are Almost Ready! As you may know, Koyote, Rush Gatherer and PowWow Dancer have been working diligently on a series based on the American Indian people, called The Four Directions. We are privileged to host this very important letterboxing series on our website. Behind the scenes, we have been designing and laying out pages that contain some of Rush Gatherer's original art. Koyote and PowWow Dancer have been looking for locations to plant this very extensive collection of 22 boxes. Letterboxers from around the country have sent in their contributions that are all tied to Native American Indian tribes. Watch for details to come and be sure to make the gathering that will serve as this series premiere.